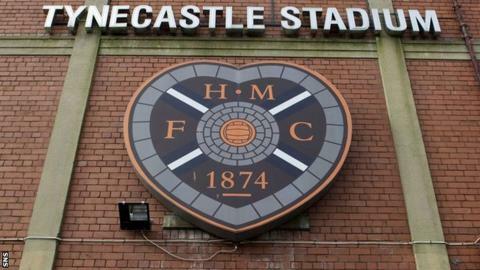 A Scottish Premier League chairman says clubs feel Hearts should not be able to add to their squad while some Tynecastle players remain unpaid. The chairman told BBC Scotland: "There is strong feeling among the member clubs that Hearts should not be allowed to sign any new players, given their latest delay in paying wages." Hearts are suffering cashflow problems. Their non-payment of player wages will be discussed at the SPL board meeting on Friday. The club chairman, who wished to remain anonymous, added that it was ''his and others' understanding that SPL rules state that if a club defaults in paying salaries then they will not be allowed to sign players". However, he revealed that some chairmen admit that rules on the matter are not terribly clear. Hearts received a first instalment of £300,000 from broadcasting rights from the SPL in August and they, like all SPL clubs, await a further payment from the league. In addition to their normal revenue streams, such as season ticket sales and corporate hospitality, the Tynecastle club's revenues have been boosted this season by their games against Liverpool in the Europa League and the sale of David Templeton to Rangers. There were four delays in paying wages at Hearts last season and the SPL's attention was drawn to the situation once more on Wednesday when Hearts gave them official written notification of the delay. It is understood that a number of the club's high earners are still awaiting their monthly salaries. Clubs are obliged to inform the SPL of wage delays within two days. Sanctions, detailed in the SPL handbook under the heading 'Default in player and club official remuneration', include the possibility of a signing embargo "until the [SPL] board is satisfied that such remuneration default shall no longer continue or subsist".